Mr. Palkovics has been invited by the Department of Mechanical Engineering and is hosted by Professor Francesco Borrelli. Mr. Palkovics is a right-wing politician and a close ally of Prime Minister Viktor Orbán. Judging from the abstract, this presentation will be an infomercial for the government. Orbán expects that his politicians go out and advertise Hungary for propaganda purposes. In Budapest the government-controlled media will gleefully advertise that far-right politicians are welcomed even at UC Berkeley. Don’t misunderstand me, Mr. Palkovics had an academic career in the past. At age 35 he was a professor at the Budapest Technological University; seven years later in 2007, he became a corresponding member of the Hungarian Academy of Sciences, followed by full membership. However, Mr. Palkovics stopped doing active research years ago. Smart, aggressive and fast-talking Mr. Palkovics is a favorite of Mr. Orbán. In 2016 he became undersecretary in charge of education and two years later the minister for the newly created ministry of innovation and technology. 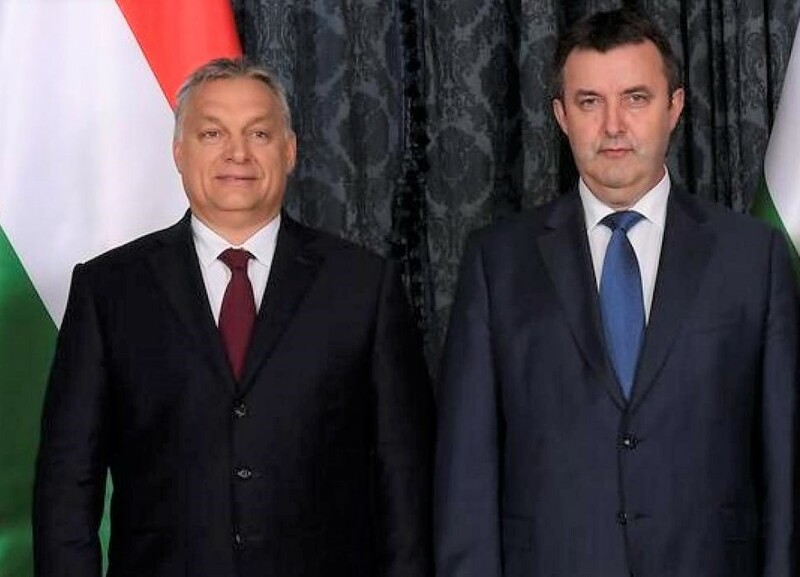 Hungary’s Prime Minister Viktor Orbán (left) and Minister of Innovation and Technology László Palkovics. UC Berkeley Chancellor Carol Christ is one of the trustees of the Central European University. On April 4, 2017 Chancellor Christ together with Leon Botstein, President of Bard College, published an editorial in the Washington Post entitled Hungary’s xenophobic attack on Central European University is threat to freedom everywhere. Obviously Professor Borrelli may invite whomever he wants, but I think his Department is making a mistake to give a podium to a right-wing politician who is cleverly using his past academic credentials to give a political stump speech at UC Berkeley. This is a publicity stunt. Please call or write Professor Borrelli and Chancellor Christ to protest Minister László Palkovics’s event at UC Berkeley. ABSTRACT Hungary, having a remarkable performance in the field of automotive industry production capacities, is becoming one of the key European hubs of developing autonomous driving systems with currently more than 10,000 development engineers working on these innovative technologies at various organizations in the country. Hungary also has a leading role in implementing and developing innovative infocommunication networks, in particular the 4G and 5G systems. Autonomous mobility has significant potential being a key sector of the future, and thus can become one of the most important strategic and development areas for Hungary. However, testing autonomous functions in a highly realistic and reproducible way is one of the biggest difficulties of today’s automotive development and validation process. Having recognized this strategic opportunity, the Government of Hungary initiated the establishment of a globally unique testing environment with the ZalaZone proving ground as its central element. The proving ground design is unique as it provides an opportunity to accomplish not only dynamic, autonomous and electric vehicle tests but also the application of forward-looking vehicle industry and related digital technologies while stimulating research and development. ZalaZONE offers a complex, outstanding development ecosystem for future technologies acting as a catalyst and synergistic hub for the different directional vectors addressing autonomous vehicle development. Dr. László Palkovics was appointed as Minister of the Hungarian Ministry for Innovation and Technology in May 2018. Previously he served as Minister of State for Higher Education between 2014-2016 then as Minister of State for Education between 2016 and 2018. Since 2016 he is a Government Commissioner responsible for research and development of autonomous and electric vehicle systems. He also held senior research positions at the Technical University of Budapest and the College of Kecskemét. Earlier he pursued an international, executive level industrial career with Knorr-Bremse. Dr. Palkovics completed his master’s degree and Ph.D. in engineering, specializing on vehicle mechanical engineering at the Technical University of Budapest. Dr. Palkovics is a member of the Hungarian Academy of Sciences. Hosted by: Hosted by: Professor Francesco Borrelli, 5133 Etcheverry Hall, 510-643-3871, fborrelli@berkeley.edu. I am surprised that you are relying on the same play book as authoritarians like Orban who shut down or regulate educational institutions to control speech. Even if Palkovics were scheduled to speak on a political subject, which he is not, neither his speech nor his appearance should be censored. If you don’t want to hear him, don’t go, but unpopular speech and/or speakers must be allowed on campus. We believe in the First Amendment, even if Orban doesn’t! The article s a bright example of plain “liberal” fascism. Mr. Lazar has no slightest respect for the American freedoms. Thank you for supplying the addresses – I’ll write my utmost approval. Perfect example of authoritarian leftist mentality, trying to censor those who one disagrees with. Not to mention that it amounts to undermining of Hungary’s economic interests. By the sounds of it, it is a speech aimed at encouraging R&D in Hungary. Now what on earth does author have against that? Oh, I forgot! 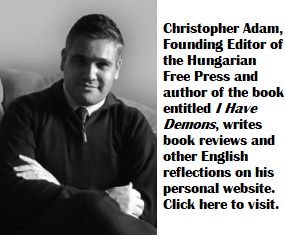 This is the author who revels in visiting Hungary, just so he can come back with stories on how poor and undeveloped it is. Proof that Trump’s measure meant to reinforce free speech on campuses was absolutely necessary. If the likes of Gyorgy Lazar would have his way, anyone who fails the leftist-globalist test would be banned from public appearances. 1) Lazar is a lousy censor. After all, he published Palkovics’s abstract above. Thereby aiding Palkovics in spreading his message. Also note that Lazar is not asking that Palkovics not be allowed to speak at UC Berkeley, but rather he speak in a forum more appropriate for what he believes will be a political speech. So, it is a lie to state that Lazar is asking for a ban. A change of venue is not a ban. Finally, Lazar is practicing his free-speech rights and it is up to the department to make the decision. Lazar has no real power of decision. He is not acting as a censor, he no power to, but rather as an activist. Academic departments have limited budgets to bring in guest speakers. The faculty in each department should weigh the benefits of each invite based on their academic, not their political merits. If Lazar’s opinion gives the department’s faculty additional information to help make an informed decision, no harm done. 2) Trump did no such thing. It was a symbolic move that simply stated enforce EXISTING federal laws and rules. Something the vast majority of schools were already doing, except for a few isolated instances that had a lot of press. The effect of this order is less than zero. In addition, the penalty the order proscribes is likely unconstitutional because it provides no clear guidelines. The language of the order is very vague and ambiguous, so academic institutions have no idea how to interpret it. This is typical of the Trump administration’s incompetence where the majority (> 90%) of its rule changes and orders have been struck down by the courts. So much free speech, that most higher education institutions have become a shining example of ideological purity. Such unnatural selection would suggest that free speech has been largely absent on campus for many decades now. That is why there tends to be such a violent, hysterical reaction whenever the campus consensus gets disturbed by an ideological intruder,which is when headlines are made. Joe, you’ve been banned from Facebook. There is a Santa Claus! Yes, most academic institutions in US and in much of Western world are ideologically purified, but social media still a threat. Using the excuse of fighting hate speech to silence dissent should be a great tool of furthering the goal of cementing the ideological dictatorship you love so much (much like the communist elites loved their absolute right to claim ideological supremacy, even as the system was failing and crumbling). We found out about the 1,200 women raped & molested on streets of Germany in one night, mostly because a huge number of those women and their friends or relatives took to social media and related their experience on Facebook. after four days, it was clear that authorities and media had no intention of making the situation public, and were only forced to do so once silence became a ridiculous position. Under current German social media censorship law, the messages of those victims would have probably been considered to be incitement of anti migrant hatred and would have been erased. I guess that is the world you want to live in! Joe you’ll be bored again the old story already felt fifty times narrated story to stir up hatred. Mr. Lazar dares to suggest his readers to write you a protest letter because you have invited the right-wing Hungarian professor and minister to give a lecture on the technical topic at Berkeley. Mr. Lazar, who have been enjoying the American freedoms for the last 40 years, has no slightest respect to these freedoms and for our way of life and thinking. I am writing to express my utmost approval of your actions and my indignation with Mr. Lazar’s suggestion that you’ll censure Dr. Palkovics. Regarding the invitation of the Hungarian educator, I am aware there are voices from Canada to dis-invite Dr Pulcovics on political grounds. Regardless of the political position that the Hungarian state may entertain, the subject matter relating to Autonomous Vehicle design should be of high interest to all concerns. As an American – Hungarian, I am reminded that two Hungarians debating, you’ll always end up with 3 positions. Not to make levity of the situation, I wanted add a word of encouragement to host Dr Pulkovics so that he may present his thoughts and ideas. Mr Palkovics is fighting for unclear evaluation principles, to suppress scientists by his standards. So, who is acting to impose politics on academia? Lazar, who has little power except to write this blog or Palkovics with the full backing of the Hungarian government. Seems like Palkovics is acting like a censor. Surely, Joe, Chuck, and Eliezer will immediately compose a letter and send it off to OV and Palkovics to complain about the politicization of science in HU. Or not. I fully support the invitation of Mr Palkovics to all Departments of Political Engineering both in the US and elsewhere. > the freedom to learn and the freedom to teach in Hungary. What happened to free speech? The intervention in the affairs of the Science of Academy was needed. When taxpayers’ money is wasted, it is always appropriate to take charge, spend money on research that will help the economy. Right! What happened to free speech in Hungary? It’s almost dead under orbàn’s quasi fascist regime, just as anything free, incl. free education and research – the subject hereof. Now why should a representative of this regime be given platform? To contribute what? Bearing in mind that spending on R&D and higher education in Hungary is one of the lowest in Europe, the education, innovation and productivity statistics are pretty bad too. Orbàn’s declarations about Hungary becoming “the manufacturing engine of Europe” came out to be nothing but hit air, etc. Are these examples to study and follow? Ironic that martaburka preaches free speech and then supports Orban’s attempt to take down the Hungarian Academy of Sciences on the grounds that work was wasting taxpayers’ money. Similar to the type of hypocrisy we get from the Trump administration. Wanting to push garbage like genderstudies on people IS a waste of money. Then again Orbán does that on his own. Everything for you is “a waste of money” that is understandable. The fact that some people think Gender Studies is “a waste of money” and is the very reason why it is a topic worthy of investigation! Besides all else, what’s the point of inviting him to speak, whereas he is talking at such speed and mumbles at the same time under his nose with such opacity that not a single, solitary soul can understand a word he is uttering. He is a great destroyer of education, yes, he is. He is a great adversary to the liberal arts and sciences, he rather prefers bureaucratic oversight by appointed watchdogs at every university. Yes he does. He is the relentless raider and robber of finances of the Academy of Sciences, an almost two hundred years old institution, the the best and most successful institution Hungary has ever produced. Yes, he is. Who could doubt then after all that he has to make a speech to the liberal university community of UC Bekeley? Nice calling for censorship there pal. Investing in you to learn reading and understanding was “a waste of money” that is understandable. I wonder why Mr Palkovics shouldn’t speak if he has something important to say? He should be able to tell the world what he thinks about basic research. That it is a waste of money. Why should he keep the world in the dark about the key to academic efficiency? That it is best if dull politicians tell them what to do and how to do it? Long live the Illiberal Academic Dictatorship! … but rather they must take ethical principles into account. But how can a researcher live up to his responsibilities if he has a supervisor who knows nothing about that, or who has thrown his ethical principles out for his personal hegemony over other researcher? In this scientific ‘Credo’, Peter Atkins considers the universal questions of origins, endings, birth, and death to which religions have claimed answers. With his usual economy, wit, and elegance, unswerving before awkward realities, Atkins presents what science has to say. While acknowledging the comfort some find in belief, he declares his own faith in science’s capacity to reveal the deepest truths. … in science’s capacity to reveal the deepest truths. In science’s capacity not in Minister of Innovation and Technology capacity.